A tornado watch was issued this morning over parts of the Northeast. There is a very moist environment in place with strong speed shear in the lower levels of the atmosphere. There is strong low level shear present thanks to a 50 knot 850mb jet from the south-southwest above southerly to southeasterly surface winds. But, the big inhibiting factor for tornadoes is the lack of instability. Much of that has to do with the cloudy skies, but also from the warm temperatures aloft. Showers and some thunderstorms have been developing this morning, but instability has been too weak. If a thunderstorm can find a pocket of decent instability, the strong low level shear does indeed offer a shot at a brief tornado forming this afternoon. This setup is similar to those that occur in central and southeast Texas every year in February and March. Only this setup has weaker shear and even less instability than what you’d find in Texas! Plus, the terrain in Texas allows a chaser a chance at seeing the tornado before it races past them moving north at 40 to 50 mph. Up here it’s just not the same. After watching all those GFS model forecasts for two weeks showing a hurricane developing over the western Caribbean and tracking anywhere from Mexico to the Gulf of Mexico to Florida, Tropical Depression Sixteen has finally formed. Granted, last week Tropical Storm Matthew developed over the central Caribbean and moved into Central America. 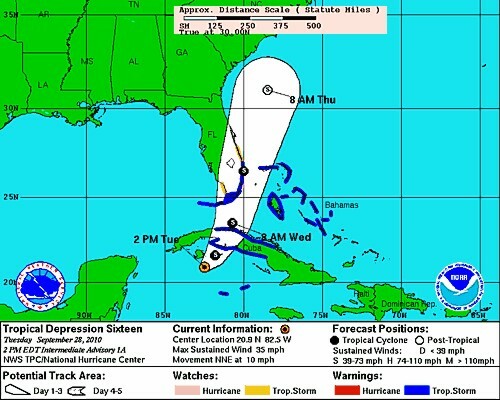 There was some debate whether or not Matthew would be the system to head to Florida this week. Well, Matthew dissipated over southern Mexico and now we have a new system heading to Florida. So go figure. Thanks to strong wind shear ahead of a cold front that is moving through the Gulf of Mexico, Tropical Depression Sixteen likely will not reach beyond tropical storm strength before making landfall over south Florida Wednesday. But, it does look like the storm will bring heavy rains to the Mid Atlantic at the end of the week as the system becomes absorbed by a trough over the eastern U.S.
Hurricane Matthew Brewing in the Caribbean? 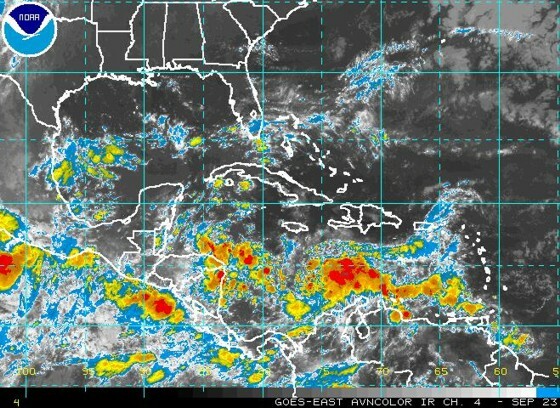 A large area of thunderstorms in the central Caribbean has peaked the National Hurricane Center’s interest. They expect this disturbance to develop into a tropical depression within the next day or two. This area of disturbed tropical weather is part of what computer models have been forecasting to develop next week into a major hurricane (take those solutions with a grain of salt). This disturbance should be over the western Caribbean later this weekend into early next week. The warm water temperatures and low wind shear environment would be supportive of a hurricane — potentially a major one (the next name on the list is Matthew). Looking at the steering currents expected next week, this storm should head north and then northeast towards Florida mid or late next week. But there are all kinds of issues to consider. How quickly or slowly does the storm move Sunday and Monday? Does it strengthen rapidly or slowly? Are computer models handling the flow pattern correctly? These are all good questions that deserve answers. So it’s too early to know for sure exactly where this storm will track next week. Though it does look like Florida is at the greatest risk from this system. And based on the conditions that should be present this weekend into early next week over the Caribbean, it seems safe to say we are talking about a landfalling hurricane — potentially a major one. 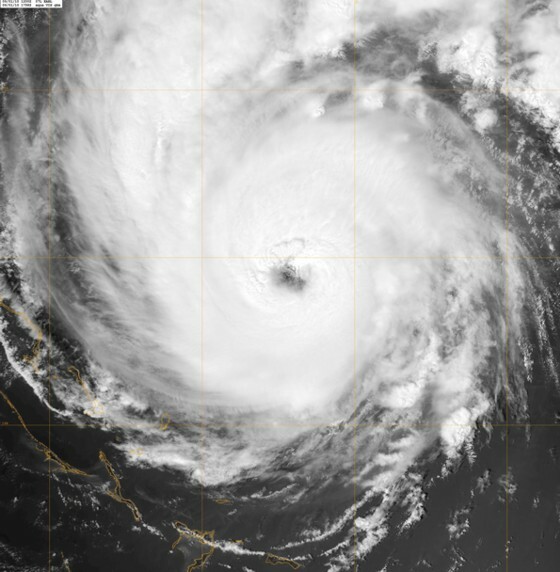 This could be the first landfalling U.S. hurricane of the 2010 Atlantic hurricane season. Hurricane chasers should keep a very close eye on this disturbance, and have their schedules open next week. Things could become very interesting! Pressure is now 969mb! It’s dropped almost 46mb in the past 24 hours! Wind speed was sustained around 70 MPH with Gusts in the 90 MPH range a few minutes ago! Pressure is now 975mb and the winds appear to be increasing in speed after a small lull in the action. Juston and I were swept off our feet by a massive wave, which crashed into shore! The eye may miss Bermuda, but we will definitely be hit by the eyewall (at least what used to be the eyewall). We are now under the central dense overcast of Igor. The winds have recently increased in speed and gusts and the current pressure is 985mb. Getting windier here! Definitely 60 MPH sustained winds with 80 MPH gusts! Blowing palm trees in Bermuda on Sunday, September 19. Shot by Simon Brewer. Below: A compilation of 3 pictures showing the barometer at different times (time, date, and pressure can be seen on all 3 of the readings). Click on image for a larger view. Three pictures showing the barometric pressure at three different times on September 19 in Bermuda. It’s 12:50pm AST and the winds are now sustained at strong tropical force speeds (50-60 MPH) with gusts up to hurricane strength (70+ MPH). The electricity has not gone out yet, but the lights have been flickering in the hotel room. It appears the center of the hurricane will pass to our west, but the ‘Eye’ of Igor is not defined by an eyewall, so the winds may get relatively calm as the center passes. The current atmospheric pressure at our location is 996mb. Our old hotel was the Surfside Beach Club, but the owners became very scared and kicked us out even though the hotel told us before we flew out here they would not close or ‘give us the boot’! Lucky for us our producer, Erin, saved us and booked us a hotel at Elbow Beach. We are so low in elevation and so close to the beach we may have a storm surge threat in our room! The waves are pounding the beaches and cliffs and it’s getting pretty breezy outside. I’ll try to post a few pictures. We are concerned the causeway will be severely damaged by Igor or possibly the airport. This would bring the possibility of us not leaving the island at a reasonable time. We’re at our hotel on the south side of the main island in Bermuda. It’s breezy and large waves can be heard and barely seen crashing on the rocky coastline about 50ft below our room! It’s going to be fun times for these two meteorologists! 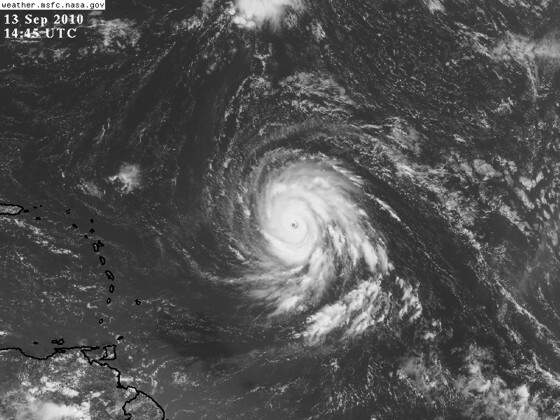 Hurricane Igor appears to be intensifying with a well defined eye forming, and beautiful feeder bands and outflow. The visible satellite image (below) from this afternoon speaks for itself. Igor is moving towards an area of enhanced large scale lift associated with a jet streak. So that may help to explain his current structural improvements. The internal structure, or eye formation, of hurricanes is extremely difficult to forecast. 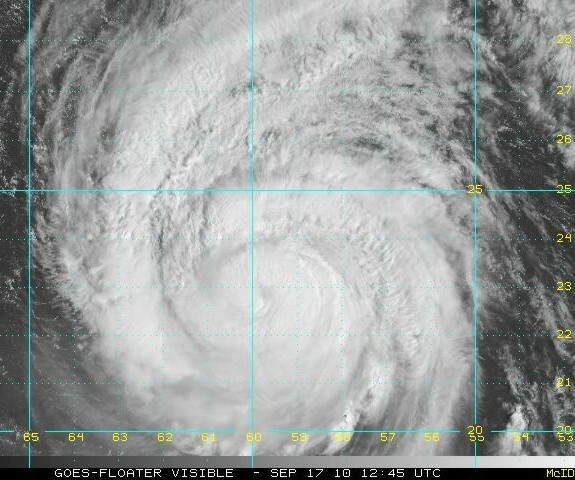 So hopefully his eye will remain in tact for Simon and Juston on Sunday, assuming Igor passes directly over Bermuda. This is quite the gamble, but sure is worth it for these chasers if it makes a direct hit. As I type this, Simon and Juston are getting ready to board their respective flights to Bermuda. They aren’t going to arrive until late tonight. Hopefully, they’ll have time to rest a bit before searching for a good place to document the hurricane tomorrow. That way they’ll be prepared for Igor’s high winds and storm surge on Sunday. 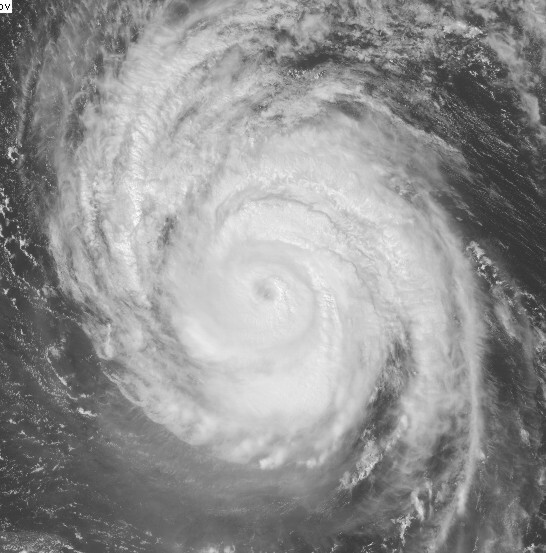 Category 3 Hurricane Igor is headed for Bermuda. Simon Brewer and Juston Drake are flying there today to document this dangerous hurricane on Sunday. Read Simon’s thoughts on the chase below as him and Juston get ready for the chase. This is going to be an amazing experience for them, and hopefully they’ll have the ability to provide updates here throughout their chase. 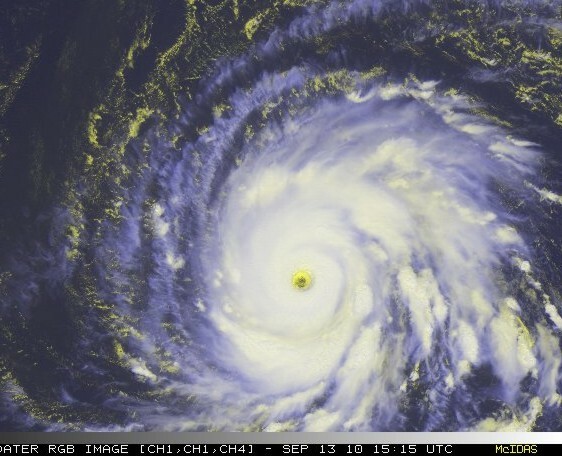 Igor is currently a category 3 hurricane, with maximum sustained winds of 120 mph. He is expected to weaken slightly over the next couple days as he moves right for Bermuda. But, maximum sustained winds are still expected to be within category 3 status, or near 115 mph. Below are Simon and Juston’s thoughts on their chase. Juston and I are anxious to chase a hurricane; we almost jumped on Earl, but he didn’t pass close enough to the East Coast. We took a chance and chased Hurricane Bill last year in Nova Scotia and it paid out, so now we’re going the distance again and attempting an intercept of powerful Hurricane Igor (yes, it would be a better name for a Halloween Hurricane) on the small island nation of Bermuda. Our goal is to fly to Bermuda and document the worst Igor can dish out in the middle of the Atlantic, and hope the eye passes directly over our location to measure the minimum pressure of the Hurricane. We will bring some meteorological measurement instruments to get data during the storm, we will be taking video and photos, and provide live updates during the storm. This will be a different type of hurricane chase for us, because we won’t be driving, except to the airport, instead, we’ll be flying to Bermuda. Once on the island we’ll go to our hotel and wait, measure, and document the hurricane helpless with no possibility to reposition if the eye wobbles away from our location. 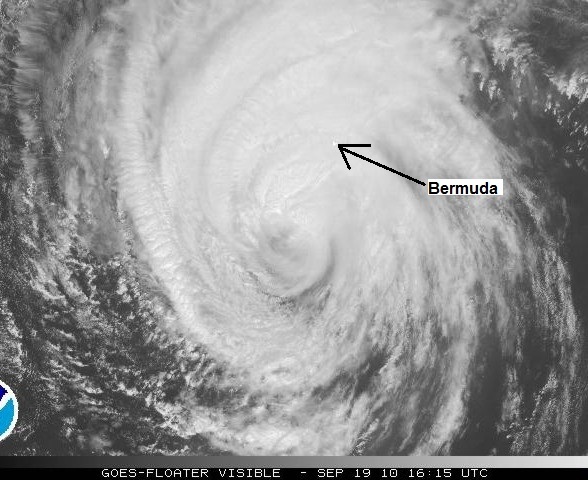 Bermuda is small, so almost any high location on the island will experience equal winds from the hurricane as it passes. Also, the coast is relatively high and rocky minimizing any damage from a storm surge. Bermuda is located in the relatively open eastern Atlantic Ocean, so locals have been pummeled by strong storms for centuries. The GDP per capita on the island is higher than any other Nation, so the island is covered with sturdy, nearly storm-proof structures. This means there should be minimal damage due to the strong winds associated with Hurricane Igor. Bermuda will be a great place to document a hurricane like Igor; it is comprised of over a hundred small islands on the edge of a large extinct volcano in the open Atlantic Ocean. We hope to experience, measure, and document possibly Category 3 strength winds (maximum 1-minute sustained winds between 111-130 MPH) and large dangerous waves pounding the rocky southern coastline. I’m not sure what pressure we’ll measure, but I’m hoping it’s in the 940mb range. Juston is flying out of Dallas in the early morning hours and should reach Bermuda Friday evening. I will be flying to New York to pick up one of my video cameras from NBC and then fly from there to Bermuda landing in the late evening. Juston and I will have all day Saturday to relax and get ready for Sunday’s assault from Hurricane Igor. 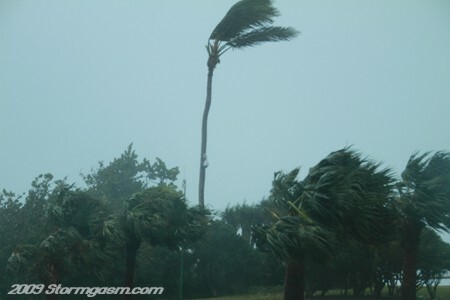 We will be doing live phone interviews, possibly video interviews, and feeding pictures or video to Stormgasm.com and The Weather Channel as Igor affects Bermuda, so stay tuned with Stormgasm.com and The Weather Channel for the latest updates. After days and days of an uphill battle, fighting dry air just like Hurricane Earl did over the central Atlantic back in August, Hurricane Igor has become a category 4 hurricane. 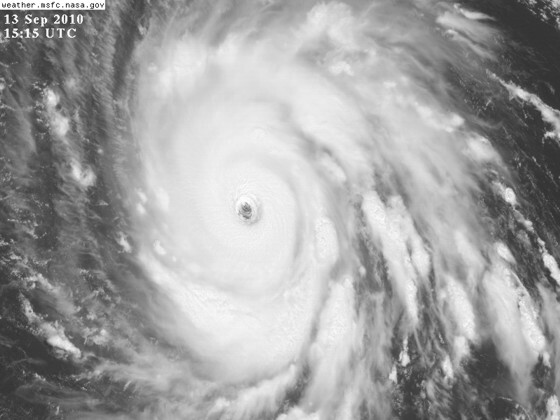 Igor has maximum sustained winds of 150 mph, which is only 6 mph shy of category 5 status. For four days after forming as a tropical storm on September 8 near the Cape Verde Islands, Igor struggled to hold his own intensity as he moved westward and faced an abundance of dry air. By 11pm on September 11, he finally became a hurricane over the central Atlantic. Since then, he has continued to strengthen and has now reached category 4 status. If these trends continue before his next eyewall replacement cycle begins, he could become the first category 5 hurricane of the 2010 Atlantic hurricane season. 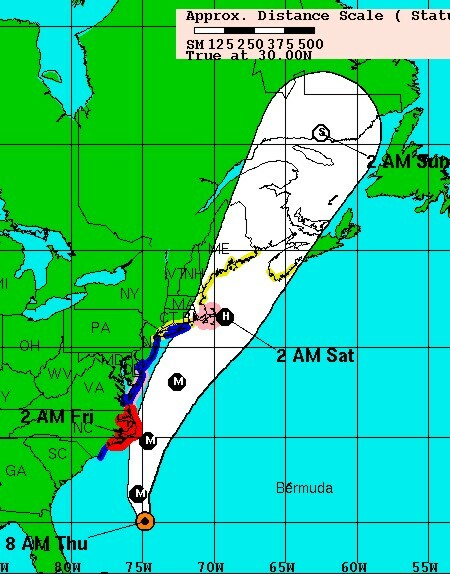 The above image shows the official track forecast from the National Hurricane Center. 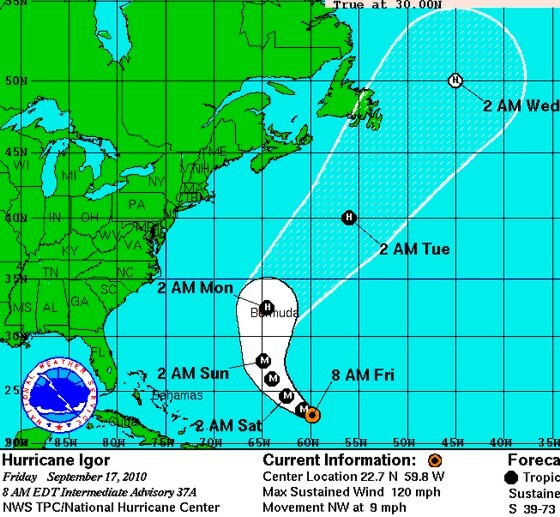 As you can see, Igor is expected to make a turn to the northwest and move into the western Atlantic over the next several days. He is going to be a threat to Bermuda, but that’s about it. The weather pattern across North American and the north Atlantic has been supporting a series of troughs over the Northeastern U.S. into the northwestern Atlantic. This is going to create a weakness in the central Atlantic ridge and cause Igor to turn northward this weekend and then northeastward early next week. In other words, these troughs are going to protect the East Coast from Hurricane Igor. This is great news because Igor is a dangerous hurricane that could cause significant damage if it did make landfall along the East Coast of the U.S.
Below are a couple more satellite images of Hurricane Igor. What a beast! Jesse Duncan, shirt model. Was my awesome and fearless chase driver May 10. Jesse Duncan models back of shirt. The Stormgasm.com T-shirt and DVD giveaway is over. 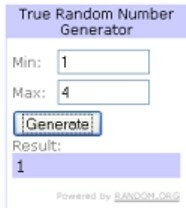 As promised, I have selected a winner randomly using a random number generator. Below is a screen capture of the number generator. So congratulations to Linda, you are the winner! 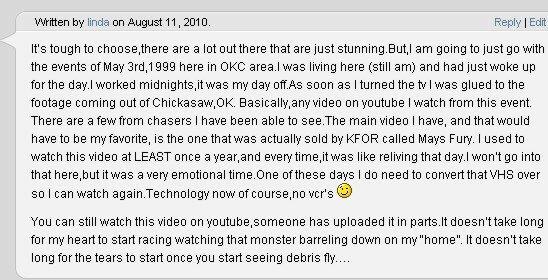 Thank you so much for you heartfelt comment and sharing your personal experience about the May 3, 1999 Oklahoma tornadoes. You should be receiving an email requesting a mailing address for winning this contest. 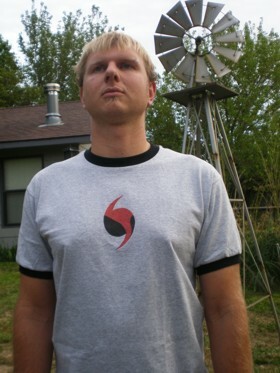 Once I have the address, I will mail you a limited edition Stormgasm.com t-shirt and a 2003 tornado highlights dvd. If for some reason you don’t receive that email, please email me (stormgasm@yahoo.com). Thanks to those of you who participated in this contest, and thanks to everyone for visiting Stormtalk. We will have another contest again in the near future. Several tornadoes were reported on Wednesday afternoon and evening across north Texas and southern Oklahoma. Homes were damaged and one person was reported injured. The remnants of Tropical Storm Hermine are to blame. Shortly after Tropical Storm Hermine made landfall early Tuesday morning, the tropical circulation continued north-northwestward and dumped tons of rain all over south, central and southeast Texas on Tuesday. 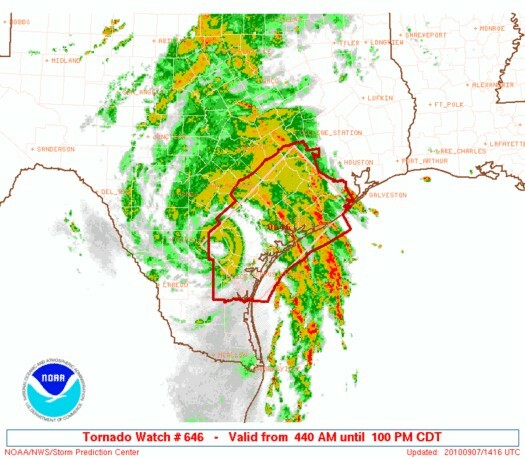 A tornado watch had been issued Tuesday morning and midday for areas in Texas. But there was just too much tropical moisture and no breaks in the rain and clouds for daytime heating. As a result, very limited instability developed and only a couple weak tornadoes were report in Texas on Tuesday. But Wednesday was different. The remnants of Hermine had made their way to north Texas, so the connection to deep, tropical moisture wasn’t as strong. A dry slot developed from the west and worked it’s way to central and north Texas by the afternoon. This helped to clear the Dallas area from expansive clouds and rain during the afternoon. The result was instability (CAPE) that was adequate enough to support vigorous thunderstorm updrafts. The low and mid level vertical wind shear was very strong thanks to Hermine’s remnant circulation. All these conditions came together and caused supercells to develop from the Dallas area to southern Oklahoma. 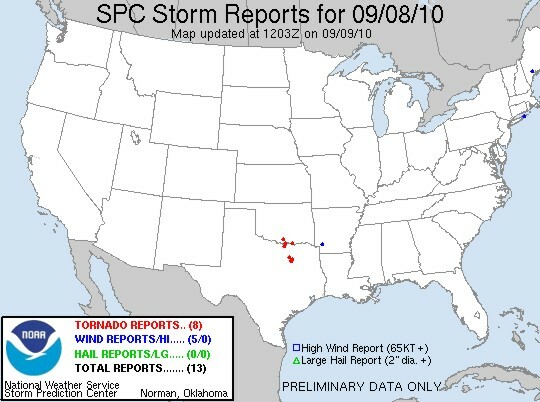 Some of these supercells produced tornadoes and caused damage. Tornadoes are not as common in Texas and Oklahoma in September as they are in the spring months. On top of that, a tropical system was moving through and not everyone associates a tropical storm with tornadoes. So, many people in the Dallas area were a bit surprised when they saw live video of tornadoes in Dallas on their local evening news. Tropical Storm Hermine made landfall across portions of northern Mexico and south Texas late Monday night. Hermine remained a tropical storm Tuesday morning as the eye moved north-northwest across the Rio Grande Valley and portions of southern Texas. Heavy rains have prompted food watches and warnings across parts of southern and southeast Texas. Tropical Storm Hermine has also prompted a tornado watch over parts of south and southeast Texas. It is common for landfalling tropical systems to bring the threat of tornadoes, especially on the east side of the tropical storm. The tornadoes form from thunderstorms that develop and intensify within the outer feeder bands of the tropical storm. Wind shear necessary in the lower levels to produce tornadoes is already present from the landfalling tropical storm. The ingredient that is usually missing is adequate instability (CAPE) to support strong, long lived cells that can become organized enough to produce tornadoes. Most of the time though, there is just enough instability to support one or two weak tornadoes. In the right kind of setup, landfalling tropical storms or hurricanes can bring significant tornado outbreaks. This happens when a pronounced dry slot moves into the east or northeast quadrant of the tropical system. This allows breaks in the clouds to form between the feeder bands, allowing substantial instability to develop. When this occurs, supercell thunderstorms develop. Since the low to mid level wind shear is so strong due to the tropical system itself, many long lived tornadoes occur in these types of setups. A great example occurred September 15 – 17, 2004 when Hurricane Ivan made landfall near Mobile Bay, Alabama. As Ivan tracked northeast and weakened across the Southeastern U.S. and Mid Atlantic states, his feeder bands spawned 127 tornadoes across Florida, Georgia, the Carolinas, Virgina, Maryland and Pennsylvania. Several of these tornadoes caused fatalities. Today’s setup across south and southeast Texas doesn’t look quite that formidable. There is an abundance of moisture on the east and northeast quadrants of Hermine, with no sign of a dry slot. The feeder bands will have limited instability to work with. So, I don’t expect more than two or three tornadoes across Texas today. If a handful end up verifying, they are likely to be weak, short lived tornadoes. Final reminder: Leave a comment in the post: Stormgasm.com T-shirt and DVD Giveaway to be entered in the contest to win a free Stormgasm T-shirt and tornado DVD. This contest ends September 10. Hurricane Earl is a dangerous category 4 hurricane, with winds estimated near 145 mph. While he is going to come close to the outer banks of North Carolina, it looks like the strongest winds on the western eyewall will remain just offshore. Hurricane force winds are still expected in Cape Hatteras, and Earl remains a dangerous storm for residents in that area. Earl will turn north-northeast early on Friday and pass southeast of Cape Cod. Earl is large enough and will pass close enough to bring tropical storm force winds to the Cape and extreme eastern MA, with low end hurricane force wind gusts around Cape Cod. 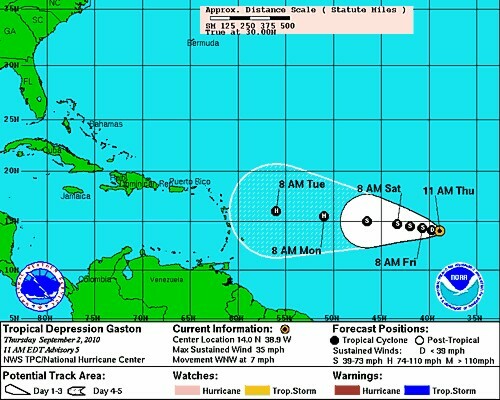 The other tropical feature of interest is Tropical Depression Gaston, which was recently downgraded this morning, after being upgraded to a Tropical Storm yesterday. Gaston, like nearly every storm so far this year that has formed over the eastern Atlantic, is being battered by dry air and even some African dust. We’ll have to watch Gaston’s progress over the next few days to see if he even survives. If he does, he is far enough south and in a weak enough flow pattern to have a decent shot of entering the Caribbean. But all it takes is a weakness in the ridge to pull him north. 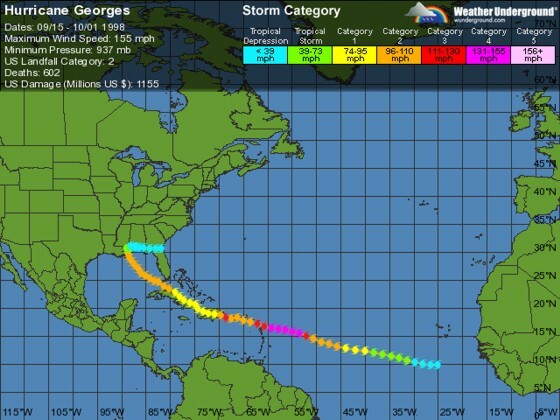 I looked back at 1998 (a La Nina year) and found Hurricane Georges. He formed in a similar place to Gaston over the eastern Atlantic, and ended up in the Gulf of Mexico! This is hardly a good scientific approach to forecasting the long term track of a storm, but it’s interesting to mention. There are plenty of options on the table, and this is just one.